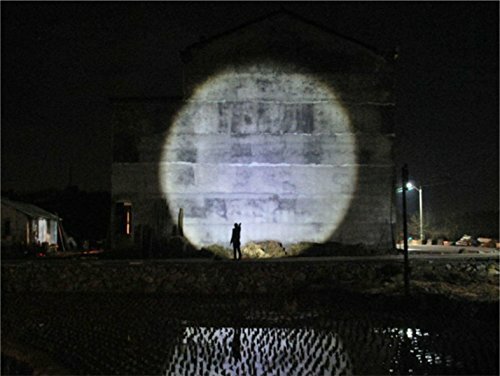 OxyLED MD50 is a compact flashlight with very high output. 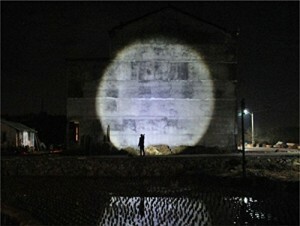 Five outputs including Strobe and SOS cover from daily use to outdoor and professional use. Multiple choices of batteries make you easy to use this flashlight. Besides, the zoomable function is also very practical when you use it for different scenarios. 500 lumens / 250 lumens / 50 lumens / Defensive Strobe / S.O.S. In an emergency situation, it is important to have a quality flashlight nearby. I usually like to keep at least one compact high-lumen torch and a couple of low-lumen micro LED lights in my EDC, BOB and vehicles in addition to scattering them all around the house. But high-end flashlights are usually quite expensive so I like to check out the budget brands regularly hoping to find a decent alternative. Today I’ll be looking at the OxyLED MD50 Flashlight which is a budget 500 lumen rechargeable kit that may be good enough. It is very hard to beat a top of the line flashlight. Their high-quality and large feature sets have undoubtedly set them apart in the past. However, with the high quality of metal alloys and other materials and processes coming out of many Asian countries have vastly improved as of late. As a result, budget flashlights keep getting better and better. Among the most popular flashlights these days are those that are made with LEDs, many using technology from Cree. Most LEDs today offer a lifespan of 50,000 hours or more, with some claiming a lifespan of much more which means that you’ll likely never need to change out the light source. No more carrying around spare bulbs or searching for replacement parts. Another impressive aspect of using LED technology is the high-efficiency of its light output. LED devices tend to be some of the most energy efficient lights available which translates into lower operational costs. Imagine not needing to have so many batteries on hand. 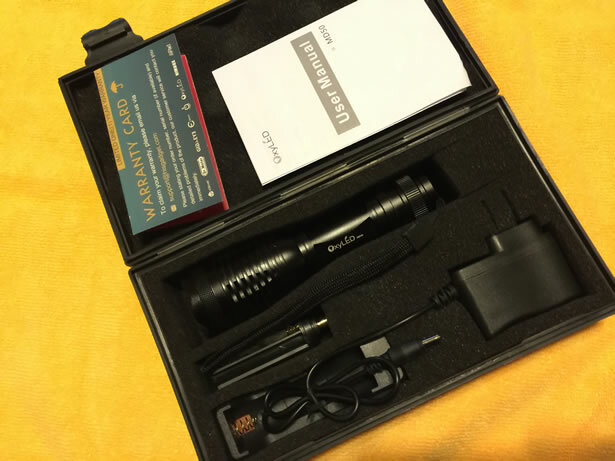 The OxyLED MD50 Flashlight kit arrives packed neatly in a black moulded plastic case approximately 8.25″ wide, 4.5″ deep and nearly 2″ tall. The lid is locked securely in place with two plastic clips which are easily released allowing the lid to open revealing the foam-lined organizer protecting the OxyLED MD50 kit. The OxyLED MD50 is 5.31″ long from end to end. The the head is 1.57″ in diameter and the barrel is approximately 1″ in diameter. Although, I do not see any mounting surface to attach the light to a firearm mounting bracket. The head, barrel, bezel ring and endcap are all made from precision-machined black anodized aluminum alloy for its exceptional strength and durability. The bezel ring provides an aggressively machined surface for self-defense purposes. Upon close inspection, all tolerances appear to be very tight and I see no blemishes or imperfections in the machining whatsoever. The green button that provides access to all the MD50 functionality is located at the base of the flashlight on the endcap. Pressing the button cycles through each of the three output levels ranging from high to low plus a defensive strobe and an SOS alert strobe which cover most of the common outdoor and professional uses. When the button has been fully depressed and released, the flashlight comes on. You can then cycle through each output mode with a partial-press of the button. The button mechanism has a 3 second memory so if you turn the light on, then off, and then back on again within the 3 seconds it will cycle to the next output mode. However, if you wait until after the third second, it will return to the highest output level. The OxyLED MD50 features the Cree XM-L LED binned at T6 as its light source utilizing a very high efficacy at very high drive currents to efficiently achieve its 500 lumen output. The head of the MD50 glides in and out to focus the beam from a wide flood beam with a lot of spread to a narrowly focussed spotlight for more versatility. The OxyLED MD50 uniquely features a focused beam so narrow that it has little or no spread whatsoever. The MD50 is designed to operate in extremely wet conditions, even in heavy rain. All openings are protected by durable rubber seals providing the MD50 with its IPX-6 waterproof rating. The IPX-6 standard consists of a resistance to heavy splashing and rain. The test sends water from all angles through a 12.5mm nozzle at a rate of 100 liters/min at a pressure of 100kN/m2 for a period of 3 minutes at a distance of 3 meters. Not only must the device continue to operate, it also must not show any sign of water seepage into the device. The weight of the flashlight including the provided KY-18650 1800mAh 3.7V Li-ion rechargeable battery and spacer tube is 6.5 ounces. Without the spacer tube, the MD50 is capable of holding a larger 26650 rechargeable battery for a longer runtime. Not only does the MD50 come with a Li-ion rechargeable battery, it also comes with a AAA battery adapter. However, the output will not be near as bright while using the AAA batteries. The MD50 kit also includes a 110-240V AC adapter and a 4.2V 500mA battery charger base which will fully charge the 18650 Li-ion rechargeable battery provided with the kit in about 4-5 hours. The kit also includes a tiny user manual and warranty card. 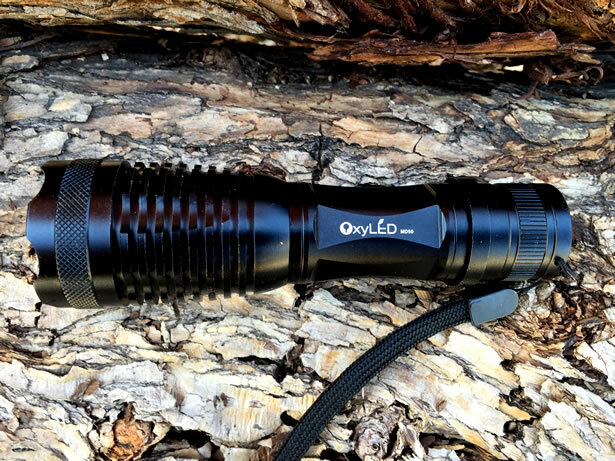 Even though the OxyLED MD50 is considered to be a budget flashlight, with $20 a price tag its performance is nothing short of amazing. After a few short weeks, I still find myself quite impressed with the high-level of quality and versatility of it. The operation of the button remains crisp and the head continues to glide smoothly in and out while focusing the beam. It is important to note that at its highest setting, like most high-output flashlights the MD50 does get a little hot over time. Additionally, As the battery power draws down, so does the intensity of the light beam. Though it is not entirely noticeable during the first 30 minutes of operation at the highest setting. After about 2 hours on the highest setting, the light beam was barely visible against the wall in a lighted room. After spending some time with the MD50, I would certainly like to see some minor improvements made to its design and functionality. It would be extremely helpful if there was a way to lock the zoom level at a desired position. This would be very helpful if you need to deploy it often. Additionally, it would be nice if it had a some sort of magnetic base and removable pocket clip attached to the side. Finally, it would also be a huge asset if there was a way to mount the MD50 to a firearm using one of the industry standard mounts. The only real negative that I found with regards to the MD50 is that the battery must be removed in order to charge it. It would be nice if there was a way to charge it without having to take it out. But that feature is also missing from many flashlights costing three or four times as much. Additionally, a better battery would also be a vast improvement. 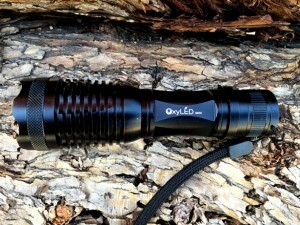 While I would certainly not replace any of my primary torches in my EDC or BOB with this one, I would definitely consider this as a good backup flashlight for around the house and garage. In fact, I think that I might even replace a few of the cheapy $5-10 ones that I have laying around with some of these. Founded in 2010 by two young and passionate entrepreneurs, Hisgadget Inc. set out to provide innovative, high quality consumer electronics to enrich and improve everyday life. Today, Hisgadget has rapidly expanded into a full-fledged global company and made its mark in the United States, Canada, Japan, Spain, Italy, France, Germany and United Kingdom.Our e-commerce platform provides both professional B2C and B2B value-added service.